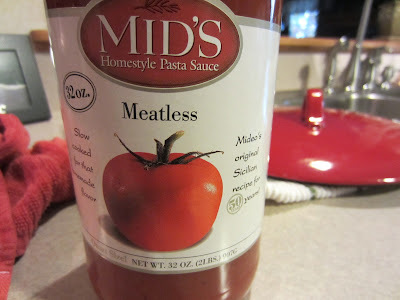 When it comes to pasta sauce, I tend to either make my own or I buy a good marinara and add my own flair to it. 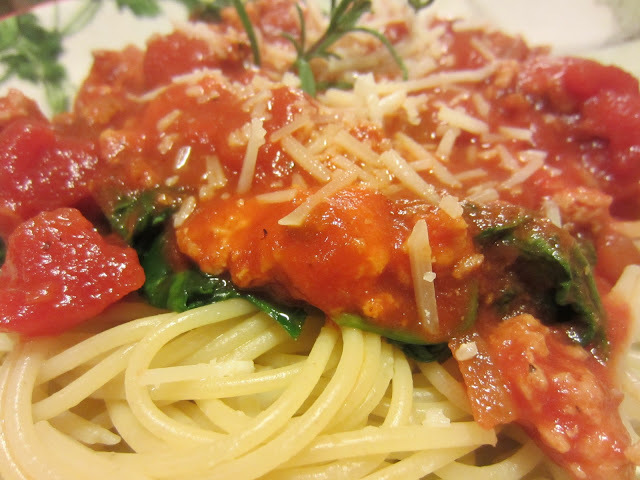 This recipe takes an ordinary and plain marinara and dolls it all up into something special. My favorite jarred marinara is Mids. I don't know if this brand is available in all markets, but I find it tastes closest to homemade. Plus, you have to love that it comes in a full 32oz size! I wait until it goes on sale, and then I stock up. 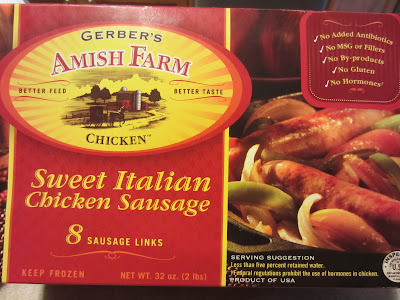 You will also find I used my favorite brand of raw Italian Chicken Sausage. Again, I believe this is a local product...but any good Italian Chicken or Turkey sausage would work just fine here. The original recipe is from Giada De Laurentiis. Giada is one of my favorite celebrity chefs. She makes the ordinary into extraordinary and I love that about her. I did sub some ingredients from the original recipe and also added a few touches of my own to suite my families taste in my version. This dish makes a quick weeknight meal. I microsteamed some spinach and layered that between my pasta and the sauce. 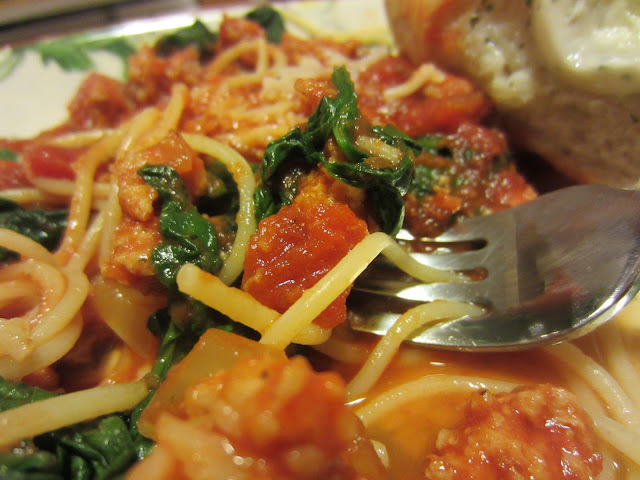 Spinach goes so well with pasta sauce and it bulks up the meal without adding on extra points. The addition of fresh rosemary adds a wonderfully different flavor to the ragu. 1. In a dutch oven, over med-high heat, warm up the olive oil. Add the chicken sausage, and cook, breaking apart as it cooks, until browned and no longer pink. Add in onion and allow to cook for about 3 minutes, or until it begins to soften. Add in garlic and cook for another minute or so. Add in rosemary and red pepper flakes. 3. Partially cover and allow sauce to start to bubble. Turn heat down to low and simmer for about 30 minutes to blend flavors. 4. Serve over al dente pasta and steamed spinach, if desired. 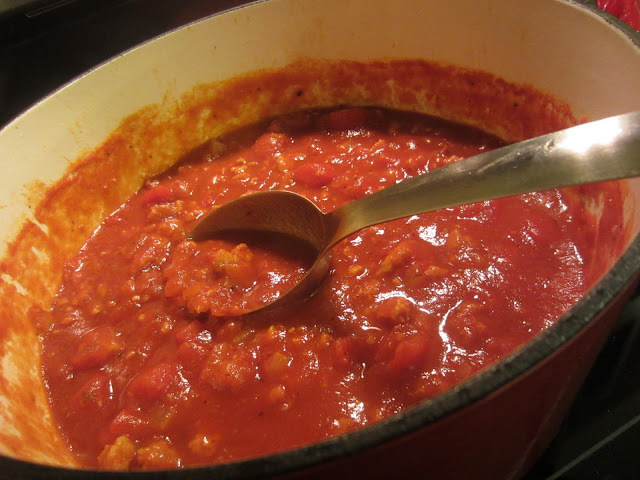 Hubby loves Italian food, and this ragu got two thumbs up. Adding the steamed spinach to my dish really bulked up the meal for me as well as adding great color and another serving of vegetables to my meal. I can't tell you how thrilled I have been with our November weather this year! Wow. So nice. But it looks like the bottom will be dropping later this week with our first real snow in the forecast! I have been taking full advantage of the pleasant weather with daily walks with our dog. Good for me.....good for her. The other thing that has been keeping my mind busy is thoughts of cookies. Not to eat, but to bake for Christmas. I have been on the lookout for some good new recipes to add to the old standbys. I know I'd better get started soon...bake and freeze so when the Christmas rush comes, I just have to package. I do a lot of gifts of cookies each year. Do you bake Christmas cookies? When do you start your baking? Speaking of cookies.....great, great news. Remember that Cookiepedia book I reviewed a few weeks ago? Well, the publisher graciously send me another copy to give away. Look for that giveaway coming soon! Oh Renee I know I would love this recipe. I don't think we have those brands here but of course I can sub my local favorites. Giada is amazing isn't she? My daughter and I love to watch her cooking show. Good job taking advantage of your beautiful November weather and getting in some walks. I usually do all of my baking on one or two days in December. Then I package it and put it in the freezer. I don't do a great deal of baking anymore, not like I use to. It seems like a lot of people are on overload with the sweets so I often times like to give non sugary - more savory food gifts. They are always well received. My mind is already churning on what that might be this year! I love Giada too...her recipes. Sigh. So good. And this ragu is a reminder that sometimes, simplest is best. I want to make this...soon! Aaa, so lovely. I love a good ragu! I too have cookies on the brain--i finally made it to 50 participants in my online cookie swap! Are you doing the Great Blogger Cookie Swap? I'm doing that one too! This sounds (and looks) so good! I have a feeling it would be a little better than my weight watchers frozen entree ;) And I have had cookies on the brain too...but mainly b/c I want to eat them. I really need to start preparing so I'm not crazed come December - which is right around the corner! yikes!